Summer school is not only for students. For the second year in a row, the Pittsburgh Council on Higher Education (PCHE) teamed up with Carnegie Mellon University’s Simon Initiative to host the PCHE Simon Summer Institute. 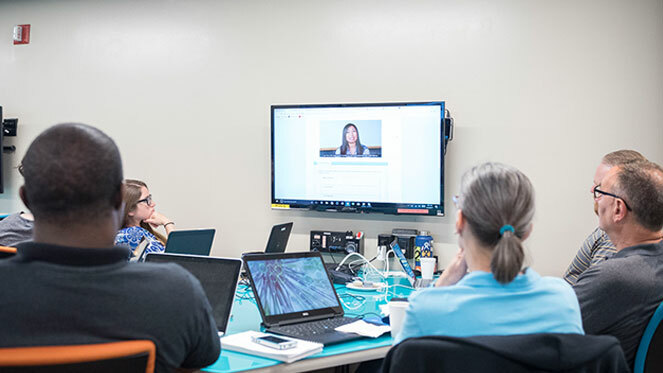 The voluntary weeklong session was designed to help faculty members from eight colleges and universities understand and incorporate Simon Initiative technologies and methods. Like last year, the “homework” for these educators involved creating learning modules using CMU’s Open Learning Initiative (OLI platform), an online tool designed to enhance learning outcomes through the application of learning science principles and tools, all the while gathering data that can inform future efforts at, well, improving learning outcomes. It is this focus on continuous data-driven educational reform that sets the Simon Initiative approach apart, as was demonstrated by the improvements made to the OLI platform from last summer. Though the new platform is still “work in progress,” Bier said, it was far more user-friendly, something returning summer-schoolers like Lyndsie Ferrara appreciated. As a forensics instructor at Duquesne University, she built upon the course module she created last year. “This year I truly appreciate all the work that went into creating a user-friendly interface. Now I can log in to the site and start uploading my own content and assessments without coding. And I’m confident that the team will continue to improve the interface,” Ferrara said. Ferrara used her module for “Ethical Reasoning Skills” to better understand the efficacy of her Professional Development IV class. It allowed her to gather incredibly practical—and surprising—data. “One major thing that surprised me was that students didn’t struggle with the concept of abductive reasoning even though it was the first time they were seeing it. Instead there were more issues identifying inductive reasoning,” she said. This insight will inform the way she structures the entire course moving forward, a course required of all forensics students. Ferrara and her team’s review of the data highlights a key foundation of the summer program – participation from CMU’s learning science experts and access to their tools. Simon faculty gave participants overviews of core learning science principles, educational data mining, intelligent tutoring systems and computer supported collaborative learning. They also offered overviews and invitations to participate in ongoing projects in using TEL to teach writing and communication, teamwork and collaboration and visual design. Along with the overviews, participants were also given access to the unique tools that support learning engineering in the Simon ecosystem, including software to investigate relationships in student learning (Tetrad) and authoring tools to design sophisticated cognitive tutors (CTAT). Tools for analyzing student data – a key part of the Simon approach – where also put into immediate use by Ferrara and her colleagues. Originally funded by the National Science Foundation, DataShop is the world’s largest repository of learner interaction data and a is a foundational part of the Simon Initiative toolkit. The week ended with eight total modules created to help students better understand things like the art—and science—of proper citations (Point Park University), prepare for a developmental math course without having to purchase a very pricey tutorial program (La Roche College) and assess the base knowledge of incoming nursing students’ writing abilities (Carlow University). Duquesne University hosted the Summer Institute. Learn how to get involved with the Simon Initiative.